We can help you to improve you current business status here at Calendar lady Promotions and our Customised Golf Shoe Bags are an excellent promotional item as it will carry your personal details and business logo to help you stay advertised. Our Customised Golf Shoe Bags come Complete with a middle zip divider, an extra front pocket and room enough to easily accommodate golf shoes. To find out more about our Customised Golf Shoe Bags click here and fill in the contact form and we'll get straight back to you. 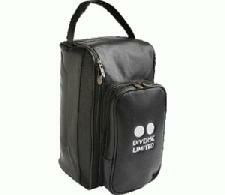 Other promotional and personalised items besides our Customised Golf Shoe Bags click here.